_MAL1603.jpg, originally uploaded by Michael A. Lowry. 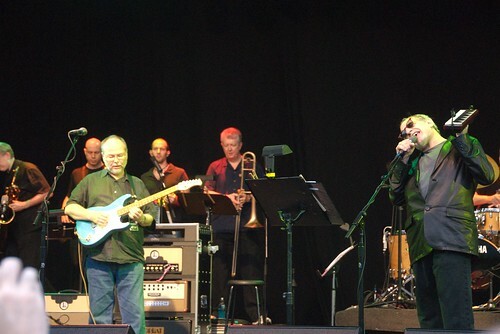 Tuesday evening, Steely Dan performed on the big stage on Skeppsholmen, as the headline act of the Stockholm Jazz Fest's opening night. The last time I saw them in concert was also the last time they performed here in Stockholm, way back in the autumn of 2000, just a couple of months after I moved to Sweden. Tuesday night's concert was a lot of fun. We got rained on a bit, but the skies cleared shortly after the band began to play. They opened with a jazz version of the theme from the U.S. game show The Price is Right, no doubt a tribute to Bob Barker, who recently retired after hosting the show for many years. Then Donald Fagen and Walter Becker moseyed onstage to the delight of the crowd. The band stuck mostly to their crowd-pleasing hits from the 70s and 80s: Bad Sneakers, Josie, Hey Nineteen, Time out of Mind, Peg, Dirty Work, Green Earrings, Aja, Bodhisattva*, Kid Charlemagne, FM and, and My Old School. After Fagen and Becker walked offstage after the second encore, the rest of the band closed with one final jazz instrumental piece. I got a kick out of Becker's interlude in Hey Nineteen, wherein he introduced the coming refrain “the Cuervo Gold, the fine Columbian…”: These are the contents of the “bag of tricks” one must have on hand in case one's wit and charm are insufficient to the task of seducing one's young companion. At his own apologetic admission, Fagen had a cold; and his voice suffered quite a bit. At his best, he's always had a rough voice, and it was at times hard to hear his vocals over the instruments. In some of the songs the bass was also a bit too loud. But in general, the mix was good and the sound was pure Dan. John Herington's guitar work was excellent, rivaling some of the other talented guitarists who've played with the band in the past. As they've done in other recent live shows, The Dan's backup vocalists Cindy Mizelle & Carolyn Leonhart-Escoffrey took turns singing the verses of Dirty Work, not doubt to give Fagan's voice a rest; this also served to share some of the limelight with the girls, who did a fine job. The crowd was a lot of fun, with folks dancing, clapping, and singing along. It was nice to see so many Steely Dan fans there. I had no idea there were so many here in Sweden! I met several really friendly folks at the concert, including the three women sitting right behind me: Kristina, Karin, and Cecilia. I felt like I had something special in common with the other concertgoers, and the atmosphere was jovial and electric. In front of us a bit closer to the stage I saw two middle-aged men who seemed to be old friends who had just met by chance at the concert after not having seen one another for many years. They were smiling, hugging each other, and introducing each other to their respective families. Steely Dan bringing people together: I like that! I wrote an email to Fagen & Becker, and told them to come back to Stockholm soon. We love you guys. Keep up the good music.